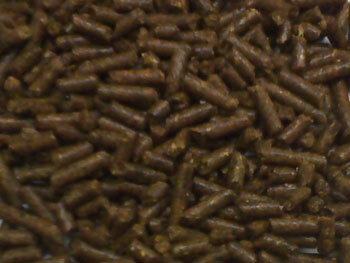 A pelleted high fat feed. Ideal for horses of any age, from foals to senior horses. A pelleted diet designed for horses of any age, from foals to senior horses. It is fortified to provide protein, essential amino acids, vitamins, minerals, prebiotics, probiotics and enzymes. Triple Crown Total Lifetime Care is designed to provide the proper nutrition for horses of all ages in order to simplify feeding for multiple ages of animals. Feed 5 lbs. to 6 lbs. per day for a mature 1000 lb. 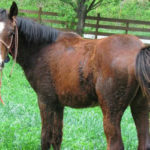 horse as a minimum to receive adequate intake of vitamins and minerals. Adjust amount fed up or down to maintain desired body condition. If feeding less than 5 lbs. per day, we recommend either changing to or supplementing the diet with 1lb. of Triple Crown 30% Supplement or Triple Crown Lite. For ponies, cut the amount in half. FEEDING YOUNG HORSES: Feed 1% of body weight to foals up to 400 lbs. For weanlings and older, the amount of Triple Crown Total Lifetime Care fed daily should be adjusted to maintain a moderate body condition. Start with 5 lbs. to 6lbs. per day divided into multiple feedings and then adjust up or down depending on the need for individual horse to maintain desired body condition. If feeding less than 5 lbs. per day supplement with 1 lb. of Triple Crown 30% Supplement to insure adequate vitamin and mineral intake. For ponies, cut amounts in half. FEEDING SENIOR HORSES: If horses can still eat hay and/or pasture, feed 5 lbs. to 6 lbs. per day for a mature 1000 lb. 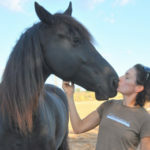 horse as a minimum to receive adequate intake of vitamins and minerals. Adjust amount fed up or down to maintain desired body condition. If feeding less than 5 lbs. per day, we recommend either changing to or supplementing the diet with 1 lb. of Triple Crown 30% Supplement or Triple Crown Lite. For ponies, cut amounts in half. For senior horses with damaged or worn teeth who can no longer or have trouble eating hay or pasture, Triple Crown Total Lifetime Care can be fed as the sole diet for your horse. Begin with approximately 12 lbs. to 15 lbs. per day and adjust up or down as needed to maintain desired body condition. Feeding these horses multiple times and off a bucket on the ground is preferable. Water may also be added to the feed to help soften for these horses with compromised teeth. For ponies, cut amounts in half. NOTE: Hay and pasture should be the main portion of any horse’s diet and each farm has a different set of circumstances in this matter. Provide plenty of fresh, clean water at all times. Keep product fresh in cool, dry storage. Examine product daily for mold or insect contamination. My name is Colton Cochran. 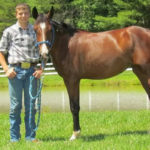 I am participating in a Bureau of Land Management youth and yearling Mustang Challenge. There are 21 youth between the age of 8 and 18 that are participating in this event. There are 21 untouched wild mustang yearlings. We have 90 days to tame and train the Mustangs. 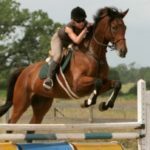 The Competition will be held on June 16, 2012 at 10 am at the Murray County Saddle Club in Chatsworth, GA. The Youth will be judged on Body conditioning of their horse, Showmanship and an obstacle course. The top 10 will then be given a 4 min Freestyle to compete for the overall winner. After the Competition some of the Mustangs will be up for adoption. Cohutta is the 5th horse I have trained but the first mustang. This has been a huge task. I have put many hours into training her and am very proud of how great she has turned out to be. Cohutta has been on a Triple Crown TLC diet only. We have chosen to feed Triple Crown Feed to our clients because they deserve the highest quality feed while under our care. Los Laureles Equine Rehabilitation and Conditioning Center provides state of art care for all types of equine athletes. From top dressage horses to barrel racers, LLERC sees all types of horse who are coming back to work after a lay up as well as conditioning. We offer the underwater treadmill, which promotes muscular strength while decreasing impact on the joints. The physical condition of the horses leaving LLERC is amazing. We have chosen to feed Triple Crown Feed to our clients because they deserve the highest quality feed while under our care. Triple Crown is the highest quality feed I’ve found available! 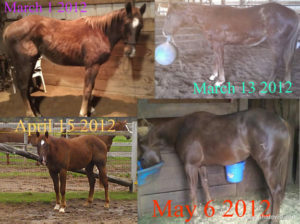 I recently transitioned my horses over to Triple Crown feed and have been really pleased with the results! My horses look and perform better and have more energy…even in the blistering Texas heat! They are show ring ready and happy to get out there and do their job! Since I do all of the feeding myself, I monitor how each horse is doing. I’ve found that I am supplementing far less now than in the past. I still have a couple horses in training who have come to me with special nutritional needs, but they are thriving and I will, hopefully, be able to wean them off of additional supplements. Triple Crown is the highest quality feed I’ve found available in my area and it is a simple choice and I believe it is the right choice for the horses at Bel Canto Farms!